When redecorating or, better yet, completely remodeling your bathroom there’s one major decision you have to make … to tile or not to tile … If you want an entirely different look, theme and vibe then all you need are the right shower tiles to create a design and style all your own. From classic black and white to bits of metallic in every cranny, we’re showing off some incredibly contemporary shower tiles ideas today and hopefully we’ll inspire you to take your boring bathroom to a whole new fresh and modern level. Of course this bathroom is already super modern and fashion forward with its choice of design, placement and bathroom essentials including the sinks and open showers. But, when topped off with these shiny, sleek black and white tiles you’ve got an absolutely fabulous, envy-worthy shower to spend your mornings and evenings relaxing in. 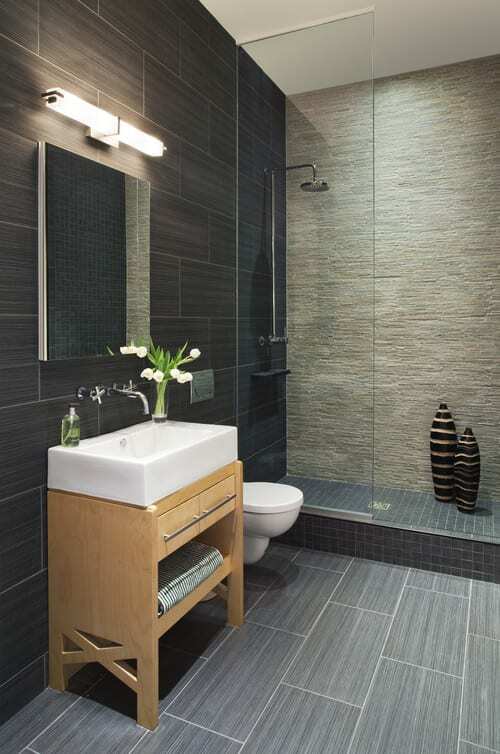 Refreshing and refined, this bathroom is neat and tidy with its all-over neutral pallet covered walls and floors. 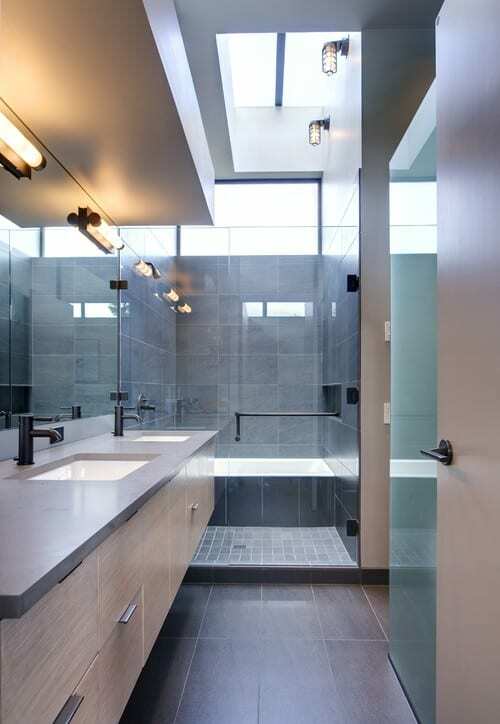 With these bigger, hazey-colored tiles you’re getting a slick foundation to create a clean, contemporary bathroom that includes a lot of depth. 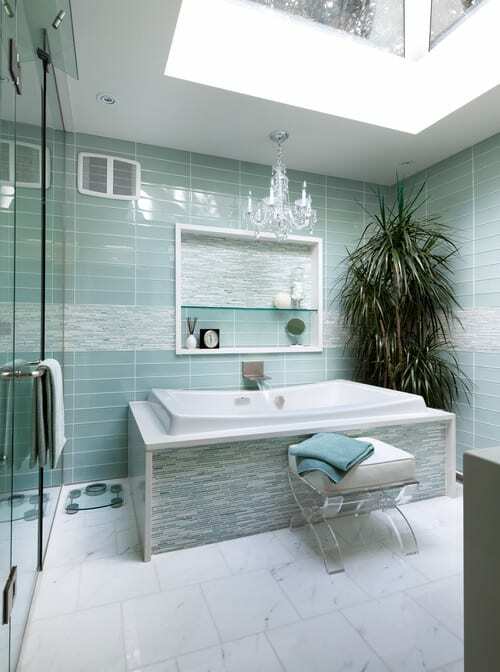 We love the glass covering to the shower which allows the tiles to become the focal point of the entire space. Although you’d think mix and matching tile sizes would create more of an eclectic vibe, when using neutral colors or classic combos, it can actually make a very modern, contemporary space. The design-element when using three different tile pieces is unlike another space where only one shape was used. It adds a more youthful, personal touch. If you’re looking for something a bit bright with more of a feminine touch, try a softer shade. It can still be very modern and contemporary. Use creams and whites as your foundation color to create the illusion of more space. Then add some sparkle in the shower. It makes an artistic spot in an otherwise, more functional than stylish room. Besides, some mosaic inspired designs add a luxurious feel. The marble tiled floor complete with water-shaded shower tiles makes for a serene, relaxing and smooth bathroom. It’s beautiful and contemporary. It’s not washed-out and still very classic in design. Again, the complementary mix of tiles makes for an artistic take on modern styles and adds an extra special unique touch just for you to enjoy. When you choose a “little bit of this and that” you’re creating a very personalized design.